New Adventures of Batman and Robin, the Boy Wonder, also known as simply Batman and Robin, is a 15-chapter serial released in 1949 by Columbia Pictures. It is a sequel to the 1943 serial Batman, although with different actors. Robert Lowery played Batman, while Johnny Duncan played Robin. Supporting players included Jane Adams as Vicki Vale and veteran character actor Lyle Talbot as Commissioner Gordon. The serials were re-released as Video On Demand titles by Rifftrax, the alumni project of Mystery Science Theater 3000's - Michael J. Nelson, Kevin Murphy and Bill Corbett. As of September 2014, they have released the entire serial series. Turner Classic Movies has broadcast the film serial from June to November 2015 in a weekly half-hour slot on Saturday mornings. The Dynamic Duo face off against the Wizard, a hooded villain with an electrical device which controls cars and a desire to set challenges for the Dynamic Duo, whose identity remains a mystery throughout until the end. All primary cast members are deceased. "As usual on a Katzman production," note Harmon and Glut, "the low budget showed everywhere in money-saving shortcuts, and inadequacies." The Batman costume had a poorly fitting cowl and the Robin costume added pink tights to cover the "hairy legs" of both the actor and the stuntman. The Batmobile is again excluded, but instead of a limousine as in the first serial, the duo drive around in a 1949 Mercury. Several mistakes and failures of logic occur in the serial. One example is that the film shows the Bat-Signal working in broad daylight. Another occurs when, despite the fact that the heroes' utility belts had been replaced by normal belts with no pockets or pouches for this serial, in order to escape from a vault, Batman pulls the nozzle and hose of an oxy-acetylene torch from his belt to cut through a steel door (the tanks for the torch are not shown); to compound this mistake, it is a full-sized oxy-acetylene torch that would have been impossible to carry unseen on his person. Harmon and Glut suggest that this was probably scripted to be a miniaturised 3-inch torch, as used in the comics, but the film-makers improvised in following the directions for a "blowtorch." The serial was released on DVD in 2005, timed to coincide with the theatrical release of Batman Begins. Unlike its predecessor, Batman and Robin: The Complete 1949 Movie Serial Collection has been given a restoration. In February 4, 2014, Mill Creek Entertainment released Gotham City Serials, a two-disc DVD set that includes both the 1943 Batman serial and the 1949 Batman and Robin Serial. Rifftrax released a Video On Demand of the first installment of the short on July 16, 2013, featuring a running mocking commentary from Michael J. Nelson, Kevin Murphy and Bill Corbett of Mystery Science Theater 3000 fame. The final episode, "Batman Victorious," was released with commentary on September 19, 2014. 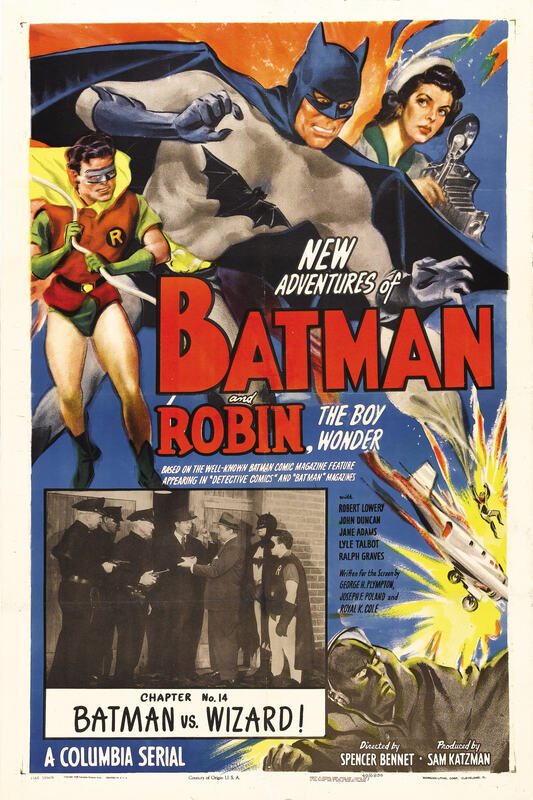 Turner Classic Movies began airing episodes of Batman & Robin in June 2015, following one week after the conclusion of airing the previous 1943 serial. Broadcast paused in August in favor of alternate programming, but resumed in September. ^ "Batman and Robin (1949) - Home Video Reviews - TCM.com". ^ a b Harmon, Jim; Donald F. Glut (1973). "10. The Long-Underwear Boys "You've Met Me, Now Meet My Fist!"". The Great Movie Serials: Their Sound and Fury. Routledge. pp. 240–242. ISBN 978-0-7130-0097-9. ^ "New Short from RiffTrax… « Satellite News". ^ Cline, William C. (1984). "Filmography". In the Nick of Time. McFarland & Company, Inc. p. 249. ISBN 0-7864-0471-X. This page was last edited on 5 January 2019, at 01:29 (UTC).